I have heard so much about this moving story -- a well-known true story from Japan about a loyal dog named Hachiko, and his unwavering love & devotion for his master -- and now it's finally making its way onto DVD. Apparently, the film had its North American theatrical release in December? I completely missed hearing about it then -- it probably got lost in the shuffle for all the holiday movies, and with shopping and the crazy pre-Christmas whirlwind, only saw a limited release. I won't spoil the plot but take my word for it, if the movie is true to the real-life story, you MUST be prepared for tears...lots of 'em! 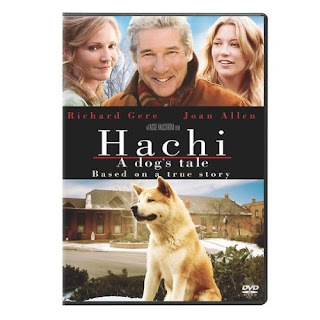 "Hachi" has an award-winning pedigree... featuring multi-award nominees Richard Gere and Joan Allen, and Academy Award® winning director, Lasse Hallstrom (Cider House Rules), and is available on DVD in North America today. Kinda fitting that such a lovely dog story is released on my Zoey's first birthday.